We print directly on to metal in high definition. This is a very cool product that has a unique look and feel. Professional quality printing so these can be used for galleries and competitions, but look great in your home as well. Metal printing is a permanent process that infuses the image directly into the metal. Come visit our store to see gorgeous samples. Looking to take metal to the next level? We did with our stacked metal prints. These are great for adding style and design to your images. 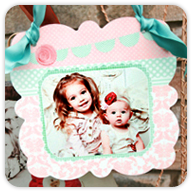 Fully customizable with any image as a background and then another image floating in front. Metal prints come in a matte finish in either brushed metal or white pearl. Brushed metal will show the gray, metal grain through your images in white and lighter areas and looks great with B&W images. White pearl is a more traditional photo look that really makes the colors in your images 'pop'. Metal shapes come in a glossy finish. Ornate shapes come in either brushed metal or white pearl and square shapes are white pearl only. We offer easels for your metal prints for sizes up to 11x14. 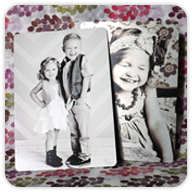 This is a great way to to create a table top display of your amazing metal prints. 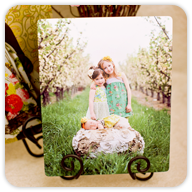 We also offer metal stands that double as a wall hanger for your metal prints for sizes up to 11x14. 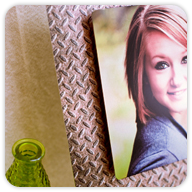 The is another great way to to create a table top display or wall display of your amazing metal prints. 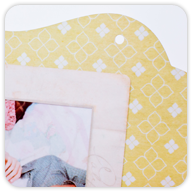 Having holes punched in your metal prints or shaped metal will allow you to add a ribbon and hang your creation directly on any wall. We have also seen neat displays hanging metal on lamps and wreath stands etc. We can add a French Cleat to the back of your mounted canvas for hanging. 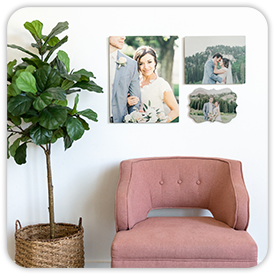 This is a neat gallery style option that gives the look of your print floating 1/2" off the wall and also adds a small drop shadow depending on your lighting. By default, your images will be cropped to the size ordered by our technicians. You can set the cropping for your images during ordering if you do not want us to decide this for you. Do you offer custom size metal? Yes! We can cut metal to any size you need up to 16x20, as this is the largest metal we offer at this time. What finish should I choose for my metal prints? Brushed metal or white pearl? This is totally personal preference, if you do not request a finish, we will use the one the looks best for the images you've ordered. White pearl metal has a white coating on the metal and then printed on that surface for a more traditional photo look. Images 'pop' and are real vibrant on this surface, which many really love. What resolution should my images be set to? This is actually a little bit tricky, your images should be 300dpi or ppi for the print size ordered. So if you are ordering a 4x6 your image should be 4x6 at 300 dpi, which is 1200x1600 pixels, and if you were ordering an 8x12 and your image is 8x12 at 300dpi your image would be 2400x3600 pixels. Our ordering system will warn you with a red x next to any print sizes that drop below our recommended 100 dpi. Do you color correct or edit my images? I need an 8x10 print, but this crops off too much of my image what can I do about this? Not much, remember that a 2x3 ratio is considered full frame for prints sizes of 4x6, 8x12, and 11x16. Any other size will crop slightly from either side. Do not send a square image and expect to print an 8x10 of the entire photo. If cropping is inevitable, please use the cropping option during ordering to crop the images yourself. This way you will know exactly how your final print will crop. Why do my images look bad or pixilated when I upload them to your system? This is because we only upload a preview of your image for faster ordering and easier zooming and cropping of your images. Don't worry your full, high resolution images are uploaded at the end of the order process. It's not likely that our ordering system is down as we do have multiple servers. This most likely is due to a configuration with the computer your are on. We recommend using either Firefox or Chrome if you are on a PC and Safari on Macs. You will get the best ordering experience if you have the current version of Java installed. You can verify your version and installation of Java here. 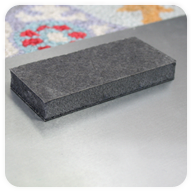 Upload your images and then select the 'metal and tile prints' tab below your images. 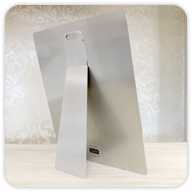 We have many amazing templates for our shaped metal that will turn your images into a spectacular display piece. If you've already designed your order, or just want the entire shape to be an image, choose the plopper button. We currently only offer a few metal stacks and plan to add more, right now only ploppers are available for these.